Phytosterols are plant steroid alcohols that have been shown to support the maintenance of cholesterol within normal range by blocking the over-absorption of cholesterol. 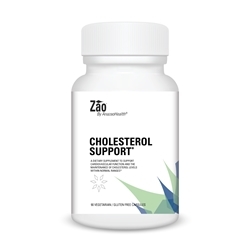 * Zao® Cholesterol Support contains a phytosterol complex from soy that yields 90% phytosterols including 180 mg of Beta-sitosterol. Take 3 capsules daily with food. Daily amount can be divided between AM and PM or as directed by your health care practitioner. Warning: If you are pregnant, nursing or taking any cholesterol-lowering medication, consult your health care practitioner before taking this product.